Big data analytics has become quite the buzzword in recent years, and its growing application in E&P operations promises to be an exciting new development. It involves: (1) acquiring and managing data in large volumes, of different varieties, and at high velocities, and (2) using statistical techniques to “mine” the data and discover hidden patterns of association and relationships in large, complex, multivariate datasets. The ultimate goal is to extract as much intelligence from our ever-expanding trove of data to improve operational efficiencies and make better decisions for optimizing the performance of petroleum reservoirs. However, the subject remains a mystery to most petroleum engineers and geoscientists because of the statistics-heavy jargon and the use of complex algorithms. This talk will provide a “gentle” introduction to big data analytics by focusing on: (a) easy-to-understand descriptions of the commonly-used concepts and techniques, (b) broad categories of E&P problems that can be solved with big data analytics, and (c) case studies demonstrating the value-added proposition for big data. 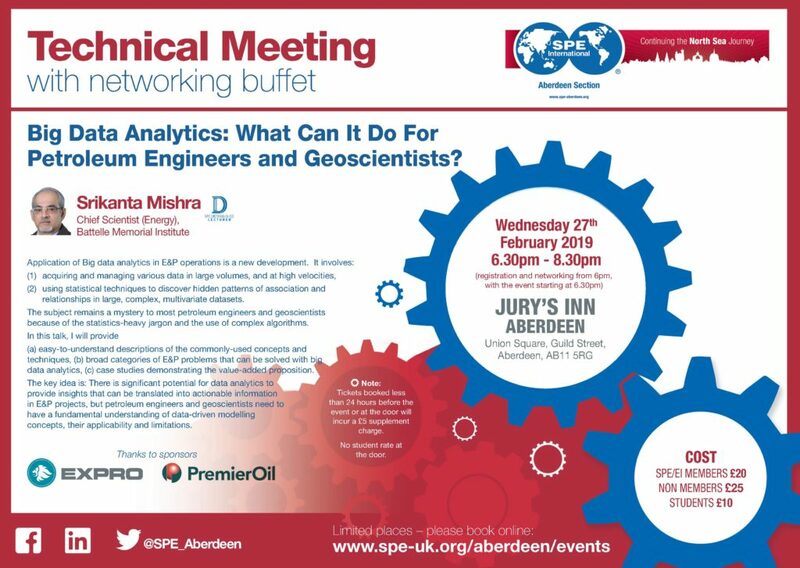 The key idea is: There is significant potential for data analytics to provide insights that can be translated into actionable information in E&P projects, but petroleum engineers and geoscientists need to have a fundamental understanding of data-driven modeling concepts, their applicability and limitations. 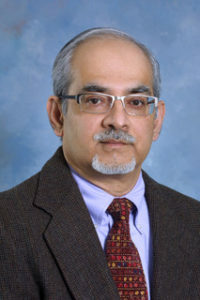 Dr. Srikanta Mishra is Institute Fellow and Chief Scientist (Energy) at Battelle Memorial Institute, the world’s largest independent contract R&D organization, where he manages a geoscience-oriented technology portfolio related to computational modeling and data analytics for geological carbon storage, shale gas development and improved oil recovery projects. Dr. Mishra is the author of “Applied Statistical Modeling and Data Analytics for the Petroleum Geosciences” recently published by Elsevier, and has also taught multiple short courses on uncertainty quantification, statistical modeling and data analytics. He holds a PhD degree in Petroleum Engineering from Stanford University.